Camps Save Cash with CCA! 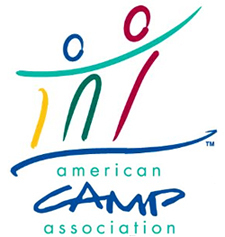 Buy printed resources from the American Camp Association Bookstore at discounted prices. Visit www.acabookstore.org, and enter the discount code CCA-2013. 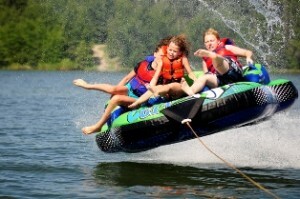 Buy camp clothing and equipment at competitive prices by visiting www.ccamping.mybrandit.com. Get reduced rates for staff who require a Pleasure Craft Operator Card by going to BoaterExam.com, and entering the username ccamping and password national. 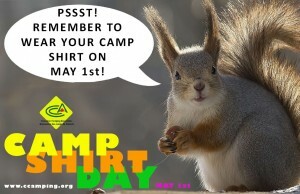 National Camp T-Shirt Day – Spread the Word! It’s time to remind all your campers and staff that May 1, 2013 is the Second Annual National Camp T-shirt Day – the day they proudly show the world what camp they call home! April 30 – not just a tax deadline! April 30 is also the deadline to register your camp for the Summer Camp Bondar Challenge. Register online at www.therbf.org for this creative, environmental program, which fuses the art of photography with science while teaching campers a love and appreciation of nature. Looking for some free programming resources for your campers? Explore the Canada’s natural and cultural history with free programs for youth offered by The Historica-Dominion Institute. Take your grade 8 campers on an adventure in any of Parks Canada’s national parks, national historic sites or national marine conservation areas – for free! The My Parks Pass program provides all grade eight/secondary II- aged students free entry to all of Parks Canada’s national parks, national historic sites and national marine conservation areas for an entire year – including the summer! Check out www.myparkspass.ca for more information and to download the Parks Pass activity guide. How much do you know about Canada? Put your campers’ Canadian knowledge to the test, and take the Canadian Citizenship Challenge for the chance to win great prizes, including a trip to Ottawa! Find out more about the Challenge at www.canadiancitizenshipchallenge.ca! Explore the richness and diversity of Canada’s history and culture by booking a free speaker to visit your camp! Bring your community’s diversity to life by booking a visit from a Passages to Canada speaker to share their inspiring story of immigration and diversity, in person or via Skype. Visit www.PassagestoCanada.com for more info! Book a speaker from the Memory Project Speakers Bureau, and invite a World War II veteran or active serviceman or woman to share their diverse military experiences with your campers: www.memoryproject.ca. The Historica-Dominion Institute is the largest independent organization dedicated to history and citizenship in Canada. Its mandate is to build active and informed citizens through a greater knowledge and appreciation of the history, heritage and stories of Canada. For more information on the above programs (and many more!) visit www.historica-dominion.ca. During the 2013 summer season, some Canadian camps will be piloting a self-evaluation study on how summer camp helps to develop resilience in children. The pilot has been designed by Dr. Michael Ungar, a Killam Professor of Social Work at Dalhousie University where he co-directs the Resilience Research Centre. On Tuesday, April 16 (7:00 – 9:00 pm), Dr. Ungar is speaking in Toronto. Dr. Ungar will discuss ways to offer children and teenagers the right amount of risk and responsibility so that they can grow up to be competent, caring contributors to their families, schools, and communities. All proceeds will be donated to help send children, youth and mothers affected by poverty to Lake Scugog Camp. For more information on Dr. Ungar’s speaking event, or to get tickets, please click here. Your Camp Could Be Next! Right now, camps in Ontario that depend on water transportation are bracing for a fight with the Federal Government to change new legislation that could put them out of business. The Ontario Camps Association is taking on the job, but the Transportation Canada Shipping Act regulations apply across the country. Knowing the magnitude of the camping industry is vital to lobbying governments. The next issue could affect your camp! Please join the seventy-five camps that took five minutes to complete this brief and confidential Business Survey to enable us to compile the statistics that are essential if we hope to be effective with current and future conversations with all levels of government. Marketing your summer is a stressful business these days. As we compete with more and more summer activities it is much harder to set ourselves apart. Families choose camp (and hopefully your camp) by relying on two strong factors to make the decision: a referral from people they respect and an emotional connection to the camp, its programs and its people. Video is a strong mechanism to reach those families on both factors. By creating a great camp video (many, preferably) you give your current camp community something that they can pass on to their friends. Something that they can use to refer your program to them. By creating great, intentional camp videos you also show families a bit of yourselves. Families need to feel comfortable leaving their children in your care, and it is hard to hide who you really are in the medium of video. Try creating a “shot list” to capture as many of these ideas as possible on video in this summer. Educate. Don’t use video as a bullhorn to just tell people how great you are. Teach parents how to choose a good camp; show them how to prepare their child so he/she does not miss home; explain your No-Cell-Phone policy. Appeal to kids. You can’t go wrong by imagining you’re Sesame Street. Keep the videos short, engaging, full of song and kid-focused. Tour a sleeping area. Parents will feel more comfortable sending their kids to you if they know what it is like inside your cabin/tents (also see #6). Keep it short. Video watchers will give you 60 – 90 seconds of uninterrupted viewing before they start to get bored. If you want them to make it to the end of your 3 minute video you better be really letting your awesome out. Anymore than 3 minutes and they’re gone. Show us your WHY. You want camp clients who feel passionate about the thing that makes your camp different from the other 15 000 camps in North America. Make sure they know what your WHY is. HINT: it’s not your new speedboat. Show off your food. Parents want to know where their kids will sleep and what they will eat. Show off your food and you are farther ahead than 99% of the other camps on YouTube. Interview your counsellors. Kids who have been to camp will want to see people they know (“Hey! Watch this video of my counsellor from last year!”) and new parents want to see who will be looking after their children. Plan ahead. 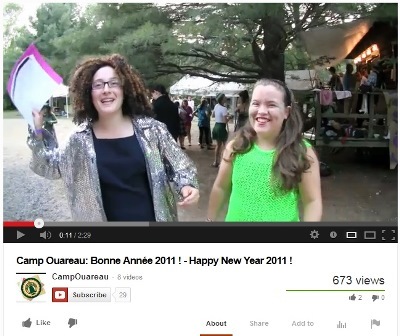 I have been using this awesome YouTube video from Camp Ouareau to illustrate this point. You have 2, maybe 3, months to capture all of the video (and photos) that you will need for next year. Make a list of the shots you want and make it someone’s job to complete that list. Know your keywords. Keywords are those words that people use to search YouTube. By including good keywords in your description and video tags you will draw in more parents who are looking to make a summer camp purchase. Check out the YouTube Keyword Tool. Support your community. Interview staff or families who are doing stuff outside of camp. Think of it as karma.